Understanding carbohydrate function is important as all cells on Earth wear a carbohydrate coat. This carbohydrate coat, termed the glycocalyx, is poised to mediate or modulate diverse and critical biological and medical events. Given the emerging evidence that this coat serves as a critical conduit of information, our group is focused on elucidating how carbohydrates are assembled, how they are recognized, and how they function. Using ideas and approaches that range from synthetic chemistry to molecular and cell biology, our research group is addressing the critical issues at this frontier. While we need to fight off infections caused by bacteria, fungi, viruses, and other pathogens, we harbor a collection of these species as our microbiome. The glycans (polysaccharides, glycoproteins, glycolipids, etc) displayed on a cell surface vary with cell type and cell state. These differences in glycosylation serve as cellular identification codes. We are elucidating how families of carbohydrate-binding proteins, or lectins, read microbial IDs to influence our microbiota and protect our epithelial surfaces. Humans have about 50 soluble lectins, many of which are produced at sites vulnerable to microbial invasion. Understanding these protein-carbohydrate interactions at a molecular level will facilitate microbial identification and the development of new antibiotics and antimicrobial therapeutics. X-ray crystallography to determine the structure of hITLN-1-glycan complex. This structure unmasked the common recognition mode among the diverse ligands: a bound calcium ion coordinates a terminal exocyclic 1,2-diol on the glycan ligand. We postulate that the specificity of microbe-binding lectins could be harnessed to diagnose diseases of microbiome dysfunction, to promote the colonization of beneficial species (prebiotics, probiotics) or to eliminate unwanted species (antibiotics). Recognition of microbial glycans by human intelectin. Wesener DA, Wangkanont K, McBride R, Song X, Kraft MB, Zarling LC, Splain RA, Smith DF, Cummings RD, Paulson JC, Forest KT, Kiessling LL. Wangkanont K, Wesener DA, Vidani JA, Kiessling LL, Forest KT. . Recognition of microbial glycans by soluble human lectins. Wesener DA, Dugan A, Kiessling LL. Curr opin struct boil. 2017; 44:168-178. The need for new antibiotics is dire. Pathogenic microbes use a suite of monosaccharide building blocks absent from mammalian cells to build their glycans. 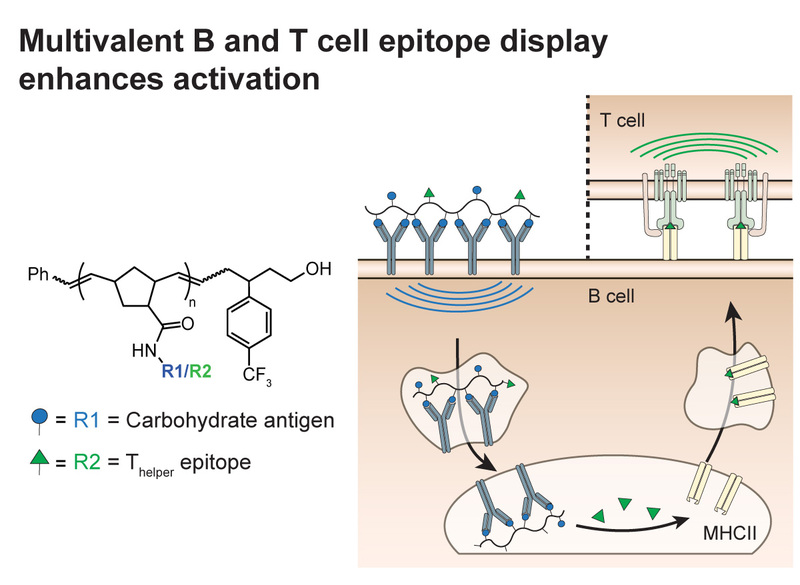 Enzymes that process these glycan building blocks and use them represent unmined targets. 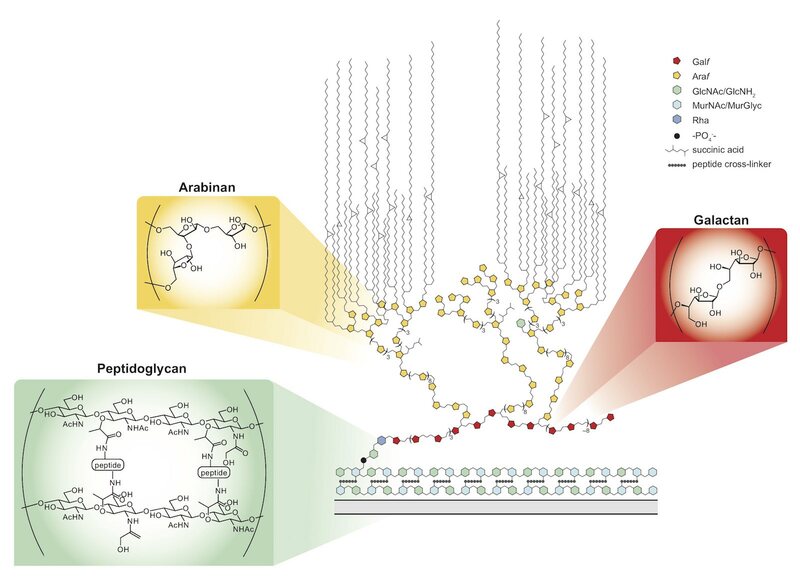 We are investigating the molecular mechanisms underlying the synthesis of microbial glycans and using this knowledge to seek small molecules that can function as new antibiotic leads. We are especially interested in Mycobacterium tuberculosis, the causative agent of tuberculosis (TB), which is responsible for over 1 million fatalities each year. Many of the most successful antibiotics used for the treatment of TB target the cell envelope. Our research aims to understand how different layers of the envelope are constructed, dissect the importance of these layers to bacterial physiology, identify new diagnostics, and new target pathways to identify next-generation antibiotics. Mycobacteria possess a mycolic acid membrane that is a barrier to antibiotics. The mycolic acids and arabinan, which tethers the mycolic acids to the bacterial surface, are validated targets of clinically useful antibiotics. Still, a molecular level understanding of envelope assembly is lacking. Chemical probes of the assembly of these structures would be valuable. We are developing agents to understand how and when key cell wall polysaccharides, the arabinan and galactan, are synthesized. We are especially interested in how the galactan is synthesized and how its length is controlled. Understanding polysaccharide length and sequence control is intriguing, as the process template independent. We have studied the carbohydrate polymerase GlfT2. We determined that GlfT2 is a processive polymerase with an intrinsic ability to control length and sequence. To understand the role of galactan length in mycobacteria, we generated mutants with truncated galactan. These agents are yielding surprising insights into how chain length impacts bacterial survival and physiology. J. F. May, R. A. Splain, C. Brotschi, and L. L. Kiessling (2009). Proc. Natl. Acad. Sci. 106, 11851-11856. DOI:10.1073/pnas.0901407106; PMCID: PMC2650292. C. D. Brown, M. S. Rusek, and L. L. Kiessling (2012). D. A. Wesener, M. R. Levengood, and L. L. Kiessling (2017). J. Biol Chem. 292, 2944-2955. DOI: 10.1074/jbc.M116.759340. PMID: 28039359. The galactan is essential for mycobacteria, yet no clinically used antibiotics target galactan biosynthesis. 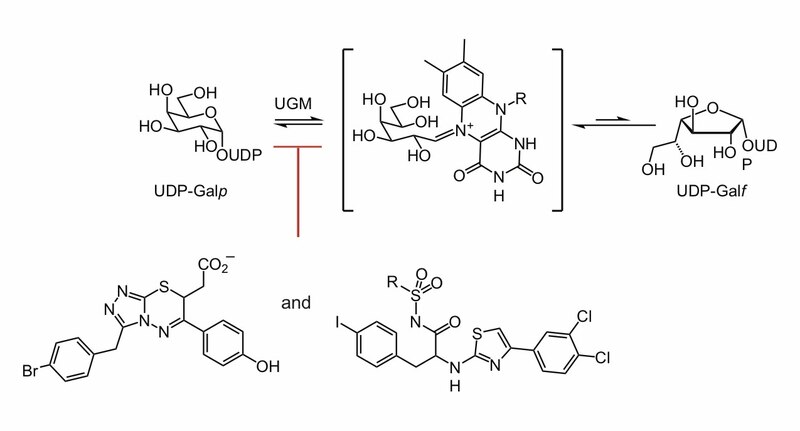 We took advantage of this untapped potential by developing potent inhibitors of the enzyme UDP-galactopyranose mutase (UGM also referred to as Glf). 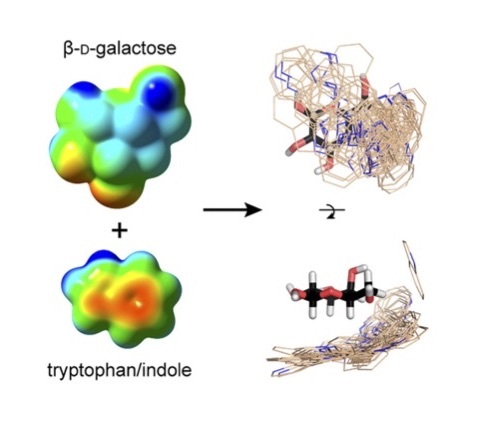 UGM catalyzes the interconversion of UDP-galactopyranose and UDP- galactofuranose, reaction required for any organism that generates glycans with galactofuranose. We showed the UGM uses a surprising catalytic mechanism: The enzyme’s flavin cofactor engages in covalent catalysis (Soltero-Higgin). This catalytic mechanism had not been previously observed. In conjunction with our knowledge of UGM catalysis, we employed high throughput screening, X-ray crystallography, and computer-based docking screens to identify UGM inhibitors (Kincaid). These inhibitors can block mycobacterial cell growth. Intriguingly, some analogs are also effective against nematode worms, another class of important human pathogens (Winton). M. L. Soltero-Higgin, E. E. Carlson, T. D. Gruber and L. L. Kiessling (2004). Nature Mol. Struct. Biol. 11, 539-543. V. A. Kincaid, N. London, K. Wangkanont, D. A. Wesener, S. A. Marcus, A. Héroux, L. Lyudmila Nedyalkova, A. M. Talaat, K. T. Forest, B. K. Shoichet, and L. L. Kiessling (2015). ACS Chem Biol. 10, 2209-18. PMCID: PMC4669066. Deleterious Consequences of UDP-Galactopyranose Mutase Inhibition for Nematodes. V. J. Winton, A. M. Justen, H. Deng, and L. L. Kiessling (2017). ACS Chem. Biol. 12, 2354-2361. Watching enzymes in action as bacteria build their cell walls can lead to new strategies to identify and treat them. The field’s ability to monitor bacterial cell growth is generally limited to peptidoglycan assembly, an important part of the cell wall that is found throughout bacteria. We generated a new probe that can be used to follow the assembly of the cell wall of mycobacteria (Hodges, Brown). This probe is processed by an enzyme complex called Ag85, which is present in mycobacteria (but not bacteria like E. coli). 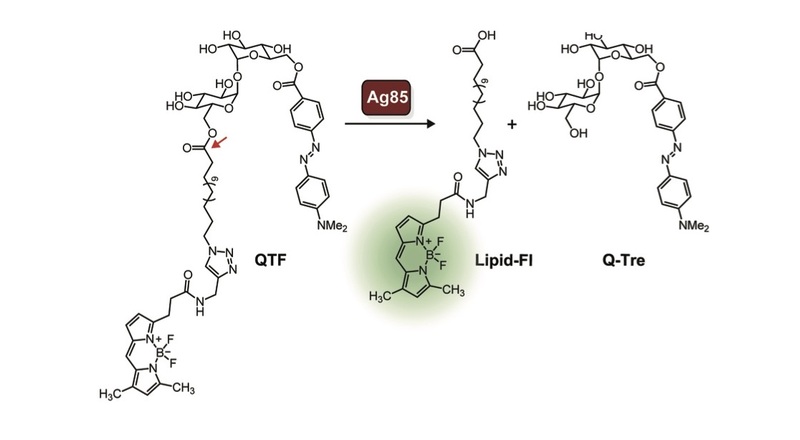 Ag85 is essential for building the mycobacterial cell wall, so understanding how and when it is active could lead to new antibiotic strategies. To our knowledge, this probe is the first bacterial imaging probe that enables real-time, continuous monitoring of mycobacteria. Using QTF, we found that Ag85 activity increases prior to cell division. Although Ag85 is abundantly secreted, its activity is localized to the growing cell wall. Because the cell wall of mycobacteria is different than that of other bacteria, this new probe also has the properties needed for a diagnostic agent. We therefore anticipate QTF can be exploited to detect and monitor mycobacteria. Pathogens and tumor cells display unique glycans. 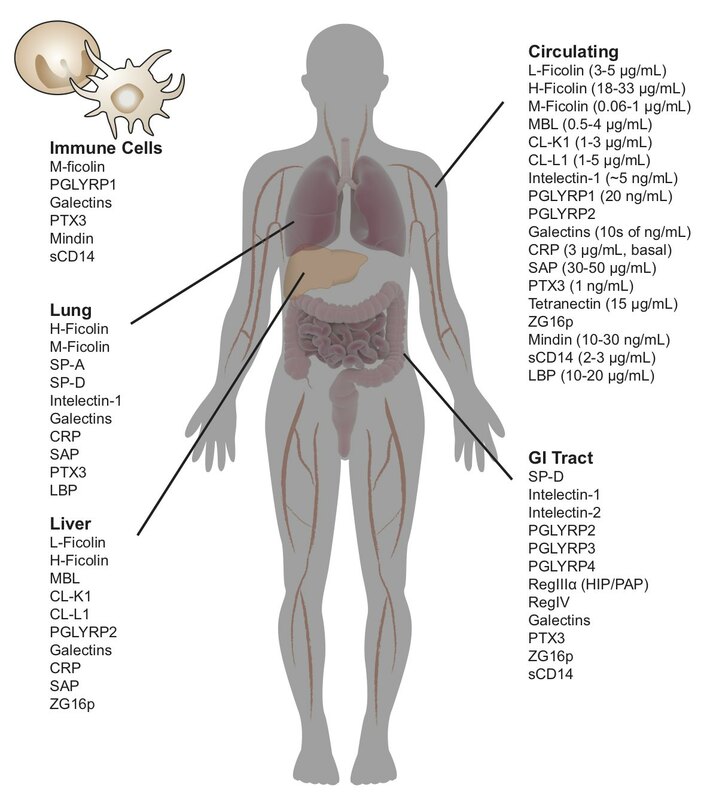 Though attractive targets for vaccines, they are poorly immunogenic. Through the use of defined polymers, we are elucidating the parameters that will afford efficacious subunit vaccines against inherently poor immunogens. We showed that the ring-opening metathesis polymerization (ROMP) could be used to assemble carbohydrate-substituted polymers with defined lengths, valencies, and arrangements of functional groups. These polymers can used to design effective carbohydrate-based vaccines and target specific cell types for delivery of our defined antigens. In complementary research, we also have shown carbohydrate-substituted polymers to selectively squelch immune responses (Courtney). A. H. Courtney, E. B. Puffer, J. K. Pontrello, Z.-Q. Wang, and L. L. Kiessling (2009). Proc. Natl. Acad. Sci. 106, 2500–2505; PMCID: PMC2650292. Pluripotent stem cells have the remarkable ability to indefinitely self-renew in culture and differentiate into any cell type. Within the stem cell niche, human pluripotent stem (hPS) cells receive signals from the extracellular matrix, soluble factors, and neighboring cells. Together, these signals direct hPS cell fate. Cell surface glycosaminoglycans (GAGs) mediate important signaling pathways critical for mammalian cell physiology but little is known about their roles in hPS cell self-renewal and differentiation. Our research addresses this gap. 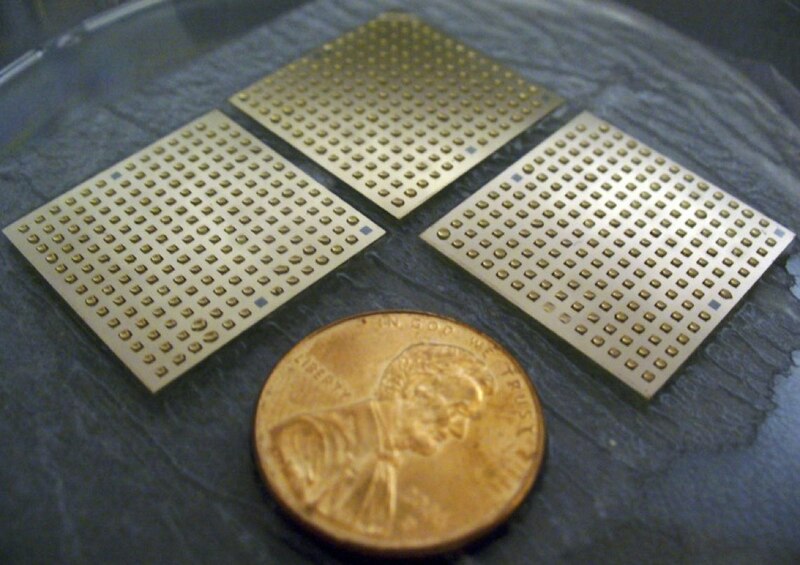 We leveraged surface arrays to identify surfaces that would support the growth of human pluripotent (embryonic and induced pluripotent) stem cells. Our surface array revealed that surfaces that display a single glycosaminoglycan (GAG)-binding peptide were highly effective. This finding was especially exciting to us because GAGs are polysaccharides present on the surface of all mammalian cells. While others have examined surfaces that can interact with cell-surface proteins, our data indicate that carbohydrate polymers are important in pluripotency. We are currently investigating the roles of hES cell-surface GAGs in pluripotency and differentiation to each germ layer. We have investigated how the stiffness of the surface on which hPS cells are cultured influences cell fate. 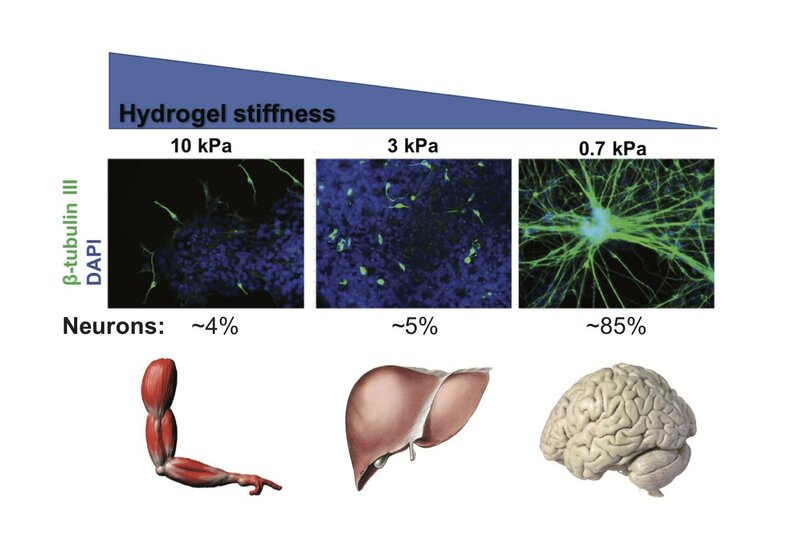 Stiff hydrogels (elastic module of ~10 kPa) displaying a heparan sulfate-binding peptide support long term self-renewal of hPS cells while a soft hydrogel cannot. Soft substrata (~0.7 kPa) independent of soluble inductive factors promote highly efficient differentiation of hPS cells into postmitotic neurons. In the absence of neurogenic factors, the effective substrata produce neurons rapidly (2 wks) and more efficiently (>75%) than conventional differentiation methods. Our current focus is on the molecular mechanisms underlying mechanosensing in hPS cells. R. Derda, S. Musah, B. P. Orner, J. R. Klim, L. Li, and L. L. Kiessling (2010). J. Am. Chem. Soc. 132, 1289-1295, DOI: 10.1021/ja906089g. PMCID: PMC2819098. A defined glycosaminoglycan-binding substratum for human pluripotent stem cells. Glycosaminoglycan- binding hydrogels enable mechanical control of human pluripotent stem cell self- renewal. Musah S, Morin SA, Wrighton PJ, Zwick DB, Jin S, Kiessling LL. Substratum-induced differentiation of human pluripotent stem cells reveals the coactivator YAP is a potent regulator of neuronal specification. Musah S, Wrighton PJ, Zaltsman Y, Zhong X, Zorn S, Parlato MB, Hsiao C, Palecek SP, Chang Q, Murphy WL, Kiessling LL. Commented [MOU1]: Abstract from Hudson et al. K. L. Hudson, G. J. Bartlett, R. C. Diehl, J. Aigirre, T. Gallagher, L. L. Kiessling and D. N. Woolfson (2015). Carbohydrate-Aromatic Interactions in Proteins, J. Am. Chem. Soc. 137, 15152-60. DOI: 10.1021/jacs.5b08424. PMCID: PMC4676033. Cell surface carbohydrates are uniquely poised to engage with proteins on the surfaces of other cells or pathogens. Indeed, protein–carbohydrate interactions have been implicated in physiological processes ranging from fertilization to development to immune system function. However, their affinities are typically 1,000- to 1,000,000-fold poorer than those of protein–protein interactions. To compensate for their low affinity, most protein– carbohydrate interactions are multivalent, whereby multiple binding groups (e.g.,carbohydrates) on one cell bind to multiple copies of a receptor (e.g., a protein) on another cell. 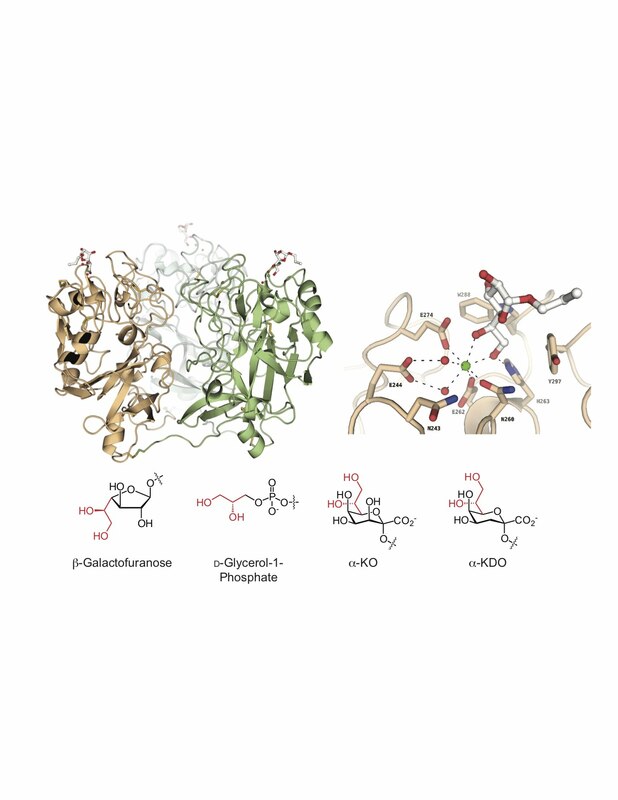 Due to weak individual interactions, it is challenging to determine if a protein- carbohydrate interaction is relevant, to assess the molecular mechanisms that contribute to formation and stabilization of protein-carbohydrate complexes, and to design potent inhibitors of protein-carbohydrate interactions. To overcome this discrepancy, we have harnessed polymer chemistry to assemble defined multivalent carbohydrate derivatives, to optimize multivalent ligand activity, and to probe the mechanisms underlying multivalency. Recognition Specificity of Neoglycopolymers Prepared by Ring-Opening Metathesis Polymerization. J. Am. Chem. Soc. 118:2297-2298. Influencing receptor-ligand binding mechanisms with multivalent ligand architecture. Journal of the American Chemical Society 124(50):14922-14933.